The study of user experience transcends a wide range of disciplines and can be somewhat difficult to strictly define. But that’s not to say that people and organizations haven’t tried. According to Don Norman, a cognitive scientist who did extensive work for Apple, for example, “‘user experience’ encompasses all aspects of the end-user’s interaction with the company, its services, and its products.” At Clearlink, we define a good user experience as the most seamless and simple journey a person can take through acquisition, purchase, and support. While the exact definition may be difficult to pin down, the best way to understand user experience is to examine and understand the experience through data. At Clearlink, we define a good user experience as the most seamless and simple journey a person can take through acquisition, purchase, and support. A UX researcher or strategist is responsible for the entire path that a customer interacts with. This customer journey begins the moment a person realizes they have a need and continues through the purchase process and the ongoing customer support after purchase. During every phase in this journey, the user is having a distinct experience and making microjudgments about whether or not to continue through to the end of the journey on your site. An organization’s goal—and the focus of a UX strategist—is to ensure that experience is positive and doesn’t drive the user out of the purchase path, but instead seamlessly guides them through completion. For example, consider the shopping cart experience on Amazon.com. After you select the product you desire (and probably a few extra products that Amazon generously suggested), Amazon has made the process simple by allowing you to purchase that product with a single click. Doing so eliminates obstacles along the purchase path and keeps the user from backing out of the process due to difficulty or confusion. Amazon has even taken an extra step to improve the experience by letting you know how much time you have to purchase that product in order to receive it by a specific date. This added information primes the user’s expectations and helps avoid future friction (in this case, confusion about shipping and receiving times), which subsequently creates a more positive experience. This experience is so seamless that it has created what experts are calling the “Amazon Effect.” Consumers don’t consciously realize how frictionless the Amazon purchase experience is—but they have come to expect it and will notice when your site doesn’t offer the same ease of use. When marketers consider user experiences, they tend to look at them qualitatively—that is, using information that can’t be exactly measured. Traditionally, if marketers want to understand how their site’s design is affecting the user, they do things like survey users on-site. If they’re particularly advanced in the qualitative sphere, they may even host user research studies and get direct user feedback that way. These methods, combined with expert “gut intuition,” have been the historical standards for UX research and design. However, thanks to advancements in online tools, UX specialists can now leverage much more evaluative, quantitative approaches in their study of experiences. Here are four techniques that can help you access and evaluate data to improve user experience and increase conversions on your sites. Heatmapping and recording tools can be particularly helpful in the study of user experiences. 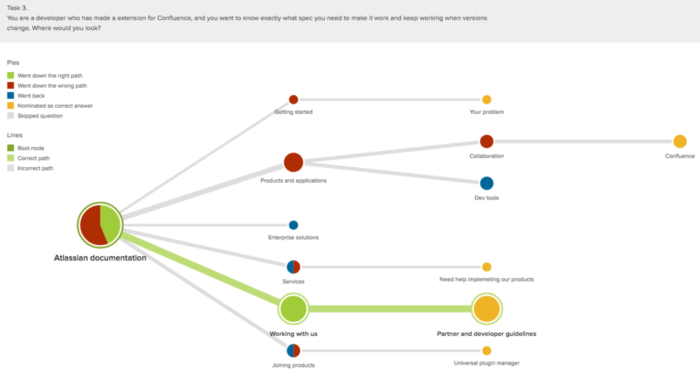 Tools like Mouseflow, SessionCam, and Lucky Orange record individual user interactions on specific pages or site-wide. Watching these recordings can lend insight into how users are interacting with page elements naturally. 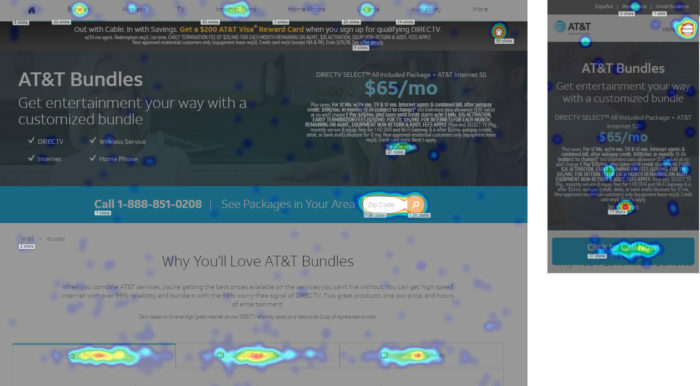 The heatmap creates an aggregated visual representation of the generalized patterns of behavior taken on your site. For example, on this page, users are interacting heavily with the navigation and menu options, but they are also interacting with the clickable tabs mid-page. This provides a clear contrast to the general UX assumption that tabs are not effective. While best practices are a good foundation to start from, using tailored research techniques can lend a more accurate view of what your specific users are looking for and how they are using your site. This, in turn, allows you to create a more seamless experience that guides the user toward a desired conversion. Marketers often rely on complex techniques or designs to guide users to desired behaviors. However, if the foundational architecture of the site is clear and structured logically, users tend to self-navigate very easily. This eliminates the need for unnecessary design cues or iconography that can clutter a webpage. If you think about how people interact with websites, they expect to find similar concepts or products grouped together. A card-sorting tool enables you to understand what users consider to be the obvious groupings. For example, if your site sells bedroom furniture, it is helpful to know whether users would naturally search for box springs and bed foundations under a “mattress” category, a “furniture” category, or another specific category just for those products. To dig even further, you can use a tool like Treejack to research a user’s reaction to specific aspects of the navigation or menu within your website. Understanding how your users are moving through the portions of your menu can give you great insight into any potential confusion, friction, or user desires. This tool can give excellent insight into whether your menu has too many (or too few) sub-layers, categories, or duplicate paths to content. This empowers you to create a menu or navigation that enables the user to find a clear path to conversion. The quantitative UX tool with the lowest barrier to entry is web analytics software like Google Analytics, Adobe Analytics, and Piwik. They can be intimidating to learn, but they can often be implemented on a website free of charge, making them well worth the effort. Using an analytics tool enables you to gather precise data about how each individual user on your site is behaving. From here, the data can be aggregated and analyzed for patterns in user paths, page interactions, and more. If you have a relatively sophisticated analytics setup that includes tag management or coordinated offline event tracking, you can leverage extremely detailed information, including what elements of the site your users are specifically interacting with (such as buttons or forms). This is critical for understanding exactly how users behave on your site. From here, it’s not hard to map out the step-by-step experience the users are having and implement tactics to streamline or otherwise improve the experience. For example, imagine that you find out in analytics that only a small handful of users have ever submitted an email lead form on your site. From here, you can leverage more qualitative tools (like site recording tools discussed above) to identify what the issue is with the form. Maybe the submit button is broken most of the time. Maybe you’re asking for extremely personal information and users are leaving the form before completing it. Without the quantitative insight into that form interaction, you may never know to dig deeper into what in the experience is causing that friction. But now that you understand what the issue is, you can work to resolve it, streamline the user path, and increase conversions. Leaving the realm of web analytics and diving into deeper data sources can open up a whole world of insight into user experiences. It’s much easier to map out the physical experience or path that a user is taking on your website if you have the metrics behind it, instead of relying solely on intuition or an abstract evaluation about what a user may find simple or effective. Having data aggregated in a database that can be analyzed for user behavior with specific elements can be critical. For example, you can use your aggregated data to increase the effectiveness of your online chat-support feature. If you have used web analytics to understand what pages most users leave your site from, you could pop the chat support option up after a user has spent some time on one of those pages. Because the user has spent some time on the page, there is an indication that they’re potentially confused, and you now have the opportunity to engage them and solve any problems. This experience would likely alleviate a lot of the friction those users were experiencing and potentially increase conversion. Database querying and aggregation is more complex than some of the easily accessible online tools, but having the power of a database can be extremely helpful in understanding or modeling user behavior. While this aggregation work traditionally falls under the scope of a data or information management team, as a UX researcher, you can help define and advocate for its need to your company. I truly believe that data is only as good as how it’s used, and if you’re able to sift through data to understand a user’s journey (or the patterns of journeys many users take), you can shape and influence the strategy of how content is presented on your website. Understandably, it can feel intimidating to apply quantitative approaches to a historically qualitative field. However, with careful application of these tools and evaluative techniques, your UX program can become much more focused and accurate. UX specialists can broaden their intuitive expertise with analysis and data that identifies patterns and opportunities for improvement. As marketing becomes much more customer focused, data-driven UX is an essential opportunity. Madison Hajeb is the CRO manager at Clearlink. She is passionate about creating a better experience for users online through A/B testing and optimization techniques. When she’s not optimizing the online landscape, she’s running, exploring new restaurants, or traveling the world. You can find Madison on LinkedIn and Twitter.